What business licenses and permits are required for SC internet business? 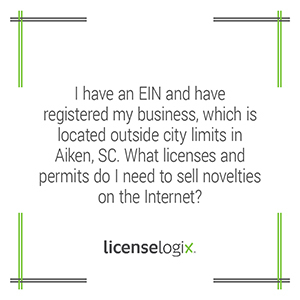 As for a business license, since you are located outside the city limits, you are considered to be in the unincorporated area of Aiken County. Generally, you would then be required to meet the licensing requirements of the county, not the city. Aiken County, however, does not require licenses for businesses in the unincorporated county area, so you are not required to obtain one. If you would like LicenseLogix to assist you in obtaining your Sales Tax ID, please contact us now to get started!